There seems little doubt that Western so-called democracies are gravitating toward increasingly autocratic politics. Executive power is being exercised by secret policy formulation, to be imposed on the electorate, or on other countries, with no regard for democratic oversight. Western states are once again flirting with fascism – as in earlier dark periods over the past century. Here is a recent snapshot of the disturbing trend. Britain’s Foreign Secretary Philip Hammond this week openly voiced his frustration with democratic process as something that is “cumbersome” for the pursuit of foreign military objectives. Meanwhile, America’s top General Wesley Clark told US media that Washington needs the power to round up “disloyal” citizens in internment camps without due legal process. Added to this is the condemnation also this week by France’s Foreign Minister Laurent Fabius of a French parliamentary delegation travelling to Russia on a fact-finding visit over the Ukraine crisis. Then we have the ongoing diktat to the Greek people of their country’s financial policies, imposed by the European Union’s creditors led by German Chancellor Angela Merkel. In each instance we see a sinister logic emboldened among Western states, whereby democratic mandate and legal standards are over-ridden by the ruling political class. What other way to describe this tendency but as a form of incipient fascism? We should not be surprised by such tendency. Despite much-vaunted claims of democracy, human rights and law, Western states have always had a propensity towards fascism. The publication of photographs last week of British Queen Elizabeth making a Nazi salute, as a young girl in 1933, along with adult members of the royal family, is a stark reminder that Britain’s ruling class were earnest supporters of Adolf Hitler and his fascist regime during the 1930s. Queen Elizabeth’s uncle, who became King Edward VIII, travelled to Nazi Germany in 1937 following his abdication. He was not only filmed giving Nazi salutes to the Führer, the British royal also plotted treasonously with the Third Reich to form a Nazi-collaborationist regime in England. In much the same way that the French ruling class, led by General Philippe Pétain, formed the despicable Vichy regime that worked assiduously with Nazi Germany to murder and incarcerate tens of thousands of their own compatriots between 1940-44. As for the supposedly noble American champions of democracy, Washington has a long and bloody history of sponsoring fascist regimes and their death squads throughout Latin America to make that continent “safe” for US capitalist exploitation. Washington’s penchant for despots and autocrats is manifest today in its unwavering support for the Persian Gulf Arab dictatorships and the Israeli regime. The same can be said for Britain, France and Germany, where weapons sales and oil interests prevail over popular demands for democracy, human rights and international legal justice. For several decades after the Second World War, Western states could make a reasonable claim of practising democracy, at least at home if not overseas. During those years, there was a semblance of electoral process and of governing policies mandated by the people. There was undoubted progress in democratic distribution of wealth and the creation of social security systems and public services in education and healthcare. However, over the past two decades, democratic reforms in Western states have been relentlessly rolled back. This retrograde process is correlated with the vast polarisation of wealth and power between an oligarchic minority and the wider population. Western “governments” are increasingly political vehicles that serve the interests of the oligarchy, while meting out economic austerity and repression on the general populace. The upcoming presidential election in the US is a classic case in point of how electoral “choice” is determined by the financial and corporate oligarchy. Whoever wins that contest will be a servant of the ruling class. In Britain, we see a Conservative administration composed of millionaires like Prime Minister David Cameron and his Chancellor George Osborne, which was “elected” by a minority of voters – only 36 per cent – and bankrolled into office by City of London finance. Now Cameron’s government is inflicting even more savage austerity measures that will leave millions of citizens much worse off, while enriching the bankers and the rich. Western countries are grappling with a systemic problem – the demise of capitalism. During the postwar decades, owing in part to the reconstruction of Europe and Asia-Pacific, the system performed relatively well, providing high levels of employment and upholding living standards. A turning point was reached as early as the mid-1970s and certainly after the early 1990s when capitalism went into secular decline. The decline has perhaps been most dramatically seen in the United States where the real earnings of workers are less now than they were in the 1970s. Real unemployment – not the dubious official figure – is over 20 per cent. Some 50 million Americans are classed as poor out of a total population of 310 million. The richest 400 American individuals have more combined wealth than 150 million fellow Americans. It is in this historical context that Western rulers are increasingly resorting to authoritarian methods of governance – out of necessity. Faced with ever-growing angry and deprived populations, the Western ruling class are challenged by democratic rights colliding with the system’s appalling dysfunction. It is also in this context that Western powers are seeking an escape route from the social tensions at home by pursuing militarism abroad. It is no coincidence that Western governments have embarked on a hostile policy towards Russia during a time when Western countries are straining from economic and social collapse. British Foreign Minister Philip Hammond claimed that Western countries are “at a disadvantage” in opposing Vladimir Putin’s Russia because Britain and its allies are encumbered by democratic procedure. Hammond’s logic means his ruling clique want to get rid of democracy in order to act as they see fit without democratic oversight. 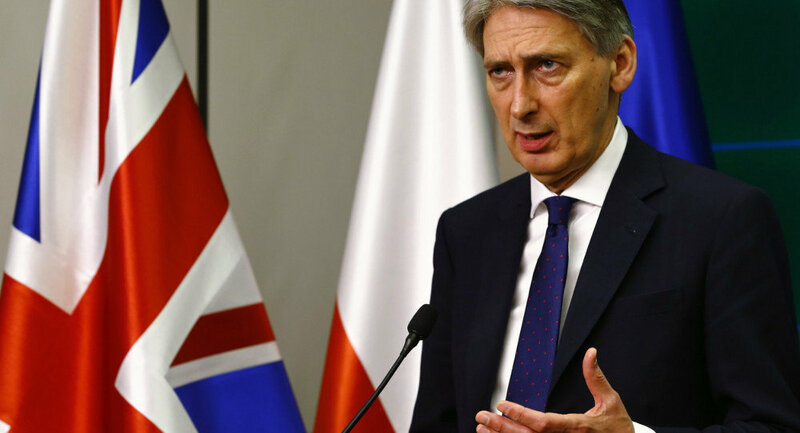 The secret bombing, disclosed earlier this month, of Syria by the British air force in contravention of both parliamentary prohibition and international law is a sign of where Hammond wants to take his government’s power. Perhaps even more noxious is the view of retired American General Wesley Clark, who is a major figure in the US political class. He told American news channel MSNBC that the time was ripe for the authorities to detain and lock-up anyone who is deemed to be “disloyal to America”. He openly cited the mass incarceration of Japanese-Americans and German-Americans during the Second World War as a favourable precedent. “Disloyal Americans” is a dangerously mutable notion. Any citizen who criticises Washington’s foreign militarism, oligarchic economic policy or its increasingly police state practices could be liable for detention without trial. Ineluctably, it seems, Western powers are moving more and more to adopt authoritarian measures against their populations. Once again, as in previous times, they are flirting with fascism to shore up their deeply dysfunctional economic system. It’s a love affair that never really died. Do People Know What They Are Talking About When They Say Fascist?